The Lucha Libre MX Women's Championship is a professional wrestling women's championship promoted by Lucha Libre MX and endorsed by the Comisión de Box y Lucha de la Cidudad de Mexico. It was created in June 6, 2015. Since 2018, this title is known as Lucha Libre MX and AWWA Women's Championship. Bengalee is the current champion. She defeated Guerrera Negra on October 7 2018 in Arena Idolos del Ring in Tampico, Tamaulipas. Sahori was the first champion. On June 6, 2015 there was a Cuadrangular Suicida Match took place in Gimnasio Stardust in which were involved Keira,& Sadica against Sahori & Star Pink. Final Team were Keira and Sadica who had to compete in a singles match. Keira became the first champion after she defeated her rival. Crazy Star was the third champion. She won a Cuadrangular match against Keira. This match was on October 2, 2016 at Unidad Deportiva Emiliano Zapata in Celaya, Guanajuato. This match involved Luna Magica & Magic Girl. Krazystar won the final to become the 3rd champion. Guerrera Negra was the fourth champion. 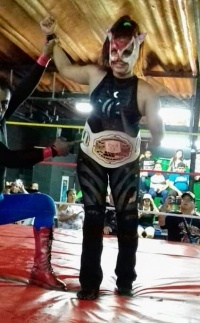 On June 15, 2018 in Arena Idolos del Ring there was a title defense scheduled in which the champion Krazystar did not show up to the match, hence Guerrera Negra was declared the new champion by default. This page was last edited on 17 March 2019, at 09:38.